Lori Deschene, author of the blog and book Tiny Buddha. It’s a personal manifesto – some guidelines for living life. PS: Lori tells a beautiful story that when she first wrote her rules for life she wrote ‘Live without rules’ five times. LOL! A simple rule based manifesto. What I love about this is that a mere five rules can cover a lot of territory. The key is not to be too specific as in ‘Always eat blueberries on Thursday’. Instead, it pitches at the level of values or general principles. Contrast this to the Yes Manifesto which has over 50 rules for life (dance and movement). Both strategies can work – choose your best way. 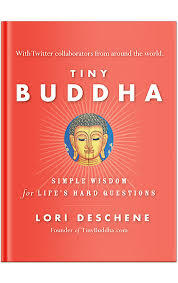 I loved reading Lori’s book, Tiny Buddha. I reviewed it here.